Here’s a quick and easy red enchilada sauce that you can make in a skillet–in no time at all! What’s so speedy about this particular Tex-Mex enchilada sauce is that it’s made in one skillet. No blender needed. 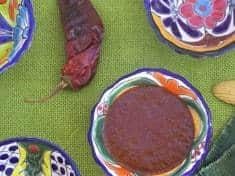 Instead of dried chiles, this sauce is made with chili powder. Chili powder, with an “i”, to differentiate from chiles, or ground chile pepper, with an “e”. Chili powder is a blend of ground red chiles, along with cumin, garlic, oregano, and other spices. 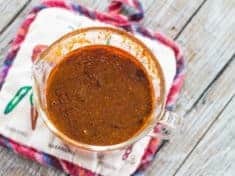 This quick and easy red enchilada sauce is made with vegetable broth and tomato vegetable juice. 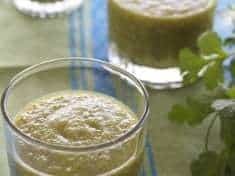 It’s thickened with a gluten-free roux of cornmeal and avocado oil, and well seasoned with fresh garlic. Robbie and I are down in south Texas, hanging out at the beach. It’s about 80 degrees with a light breeze, and about 90 degrees humidity. Warm and sultry. South Padre Island. You might say that Robbie is addicted to kitesurfing and that’s why we’re here. But I don’t mind. A dig of the feet in the sand is always good for the soul. The bars on the island already have their banners up–advertising 2:1 margaritas on Cinco de Mayo. Not. We’ll be celebrating at home—eating Mexican food and drinking pink hibiscus margaritas. Hold on to your sombrero—you are going to go crazy for these chile relleno enchurritos, which are enchiladas made with flour tortillas, and moistened with red enchilada sauce. Easy and quick red enchilada sauce is not truly authentic. For the real deal, find my authentic red enchilada sauce recipe here. 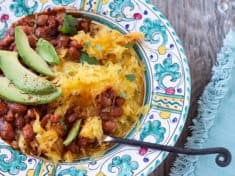 For Mexican spaghetti squash, stir this sauce into pinto beans and ladle it onto baked spaghetti squash–recipe here. Another recipe idea, with a story of Cinco de Mayo–chard and pepper jack quesadillas. Wishing you a fabulous weekend–get in the kitchen and cook something spicy! 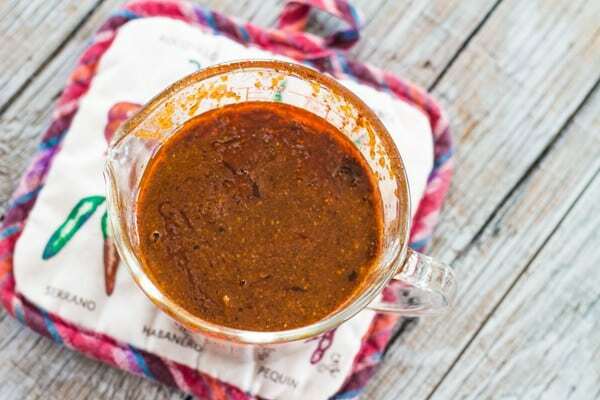 This super easy sauce adds flavor and color and can turn anything into Mexican food. Makes about 2 1/2 cups. Try mixing it into beans, or as a dip for chips! Heat the oil in a medium skillet or saucepan over medium flame. Stir in the garlic; cook a minute. Stir in the cornmeal and chile powder and cook, stirring constantly, to make the roux. Slowly pour in the vegetable broth and vegetable juice, continuing to stir. Let simmer, stirring occasionally, until the mixture thickens into a sauce, 5 to 10 minutes. This recipe uses cornmeal as a gluten-free sauce thickener. You can substitute whole wheat or all purpose flour. If you don't have vegetable juice, substiture more vegetable broth for the juice.